Although lamb in general is tender meat, some cuts are tougher and will benefit from long, slow cooking. Shanks are the most common example, but the shoulder is also best when slow-cooked. It's usually cut for low-cost lamb chops, but most butchers will happily sell you a shoulder roast, either boneless or bone-in, if you call ahead. A bone-in shoulder is moister and richer in flavor but complicated to carve, so most recipes call for a boneless rolled shoulder. They can be roasted as-is, or stuffed. 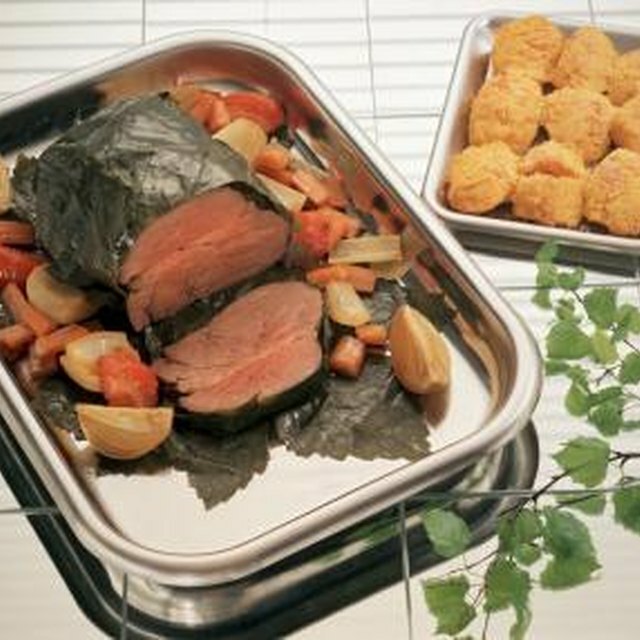 Check your roast to ensure that it's tightly rolled. A tightly rolled shoulder cooks more evenly than a loosely tied roast. If necessary, re-tie the roast yourself with cotton kitchen twine. Wipe the surface with paper towels to dry it and remove any loose fragments of fat or bone left by the butcher. Trim the outer layer of protective fat to make its depth uniform, but don't cut it away. You'll need it to keep the lamb moist during cooking. Score the fat lightly with your knife blade, taking care not to cut into the meat. Sear the meat in a hot skillet until well browned on all sides. Move the lamb to your cutting board. Mash the minced garlic with the side of your knife until it becomes paste, and spread it over the entire roast. Season liberally with salt and pepper, or any other combination of flavors that appeals to you. Remove the lamb from your oven and let it rest under a loose cover of aluminum foil for 15 to 20 minutes before carving. Lamb is cherished in many culinary cultures, so the basic recipe can be easily adapted to a different cuisine by changing the seasoning.